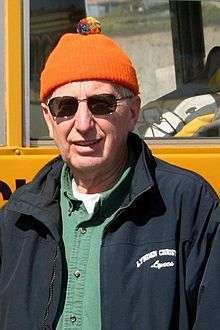 Harlan Kredit (born 1939) is a multiple award-winning Dutch-American high school teacher from Lynden, Washington. He was the first Washingtonian teacher ever to be inducted into the National Teachers Hall of Fame. He has spent the majority of his career at Lynden Christian High School. Kredit is also a ranger at Yellowstone Park in Wyoming during the summer and a prolific photographer for the National Park Service. Kredit has gained renown for his "investigative" approach to teaching secondary biology and emphasis on leadership, and for his efforts in fish and wildlife conservation, particularly along Whatcom County's Fishtrap Creek (which eventually dispenses into Puget Sound). His students know him for his familiar exclamation of "It's a great day to be alive!" Harlan Kredit was born and raised in Lynden, Washington, alongside Fishtrap Creek, which contained "huge numbers of salmon each fall." Kredit graduated from Calvin College in 1961 and taught high school science education in Hudsonville, Michigan from 1962 to 1972. In 1967 he gained a master's degree in Science Teaching from the College of William and Mary.